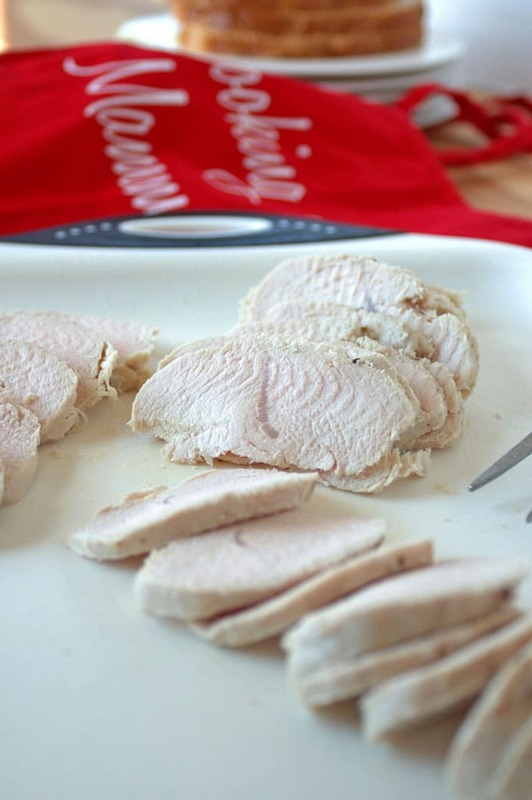 Homemade Turkey Lunch Meat is so easy! In just over 30 minutes, you’ll have delicious, juicy sandwich meat that’s healthier than what you can buy at the deli! Can you believe homemade turkey lunch meat takes just a minute of prep and needs only 30 minutes in the oven? I had no clue. Some of you might be yawning, but this is an exciting discovery for me! It’s life-changing, I tell you. This method is so easy, I don’t plan on buying any more sodium-nitrate-filled, sugar-laden deli turkey for my guys’ sandwiches. 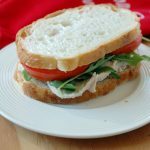 If you’ve been reading this blog from the beginning, you know I gave up lunch meat almost three years ago and stopped buying it for everyone in my household. (See my Recipe to Lose Weight Without Dieting.) My family didn’t seem to miss it, but this summer, the guys pushed back. With doctor’s orders to watch sodium and processed foods, I tried buying low-sodium deli meat, which still has lots of salt and costs as much as seafood. I even bought sodium-free turkey once…and I might as well have made sandwiches with shoe leather, it was so dry. Ugh! The recipe I’m thinking of called for a three-pound turkey breast…but I ended up using fresh turkey breast tenderloins. Why? Because when the grocery’s butcher walked me over to frozen foods and showed me what he had in stock there, I began reading the labels and became irritated. (Don’t worry, I waited until he walked away before I started cussing.) I mean, if I wanted turkey jacked up with sodium and sugar, I might as well have gone back to the deli counter. Ugh! So, I walked over to the meat case with the plain-Jane (yes!) 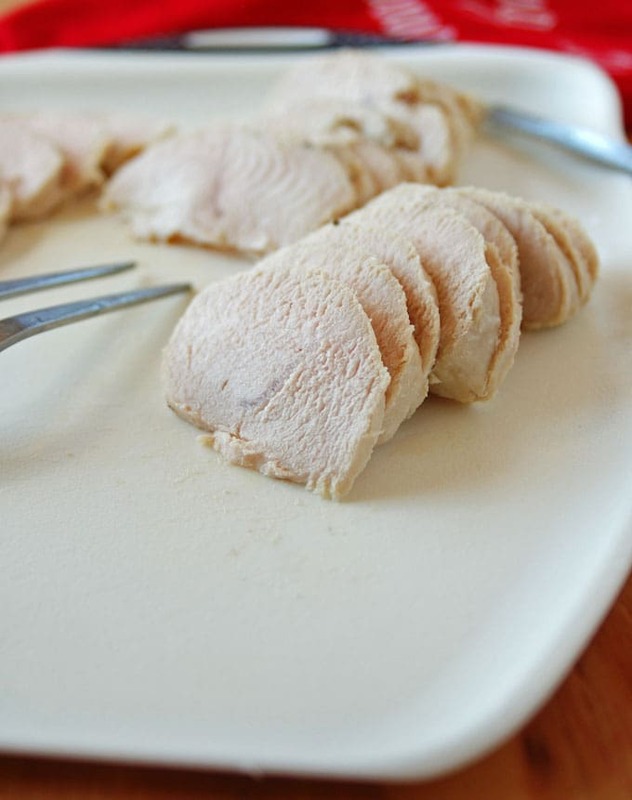 turkey breast tenderloins sold in a package of two, weighing in at just under two pounds total. I actually bought nearly four pounds (I know you’re shocked) and roasted turkey breast tenderloins for dinner, then thinly sliced up the leftovers for sandwiches. It worked beautifully, and I even froze some for later. Even though I added salt before cooking the turkey, I know it’s less than what’s in the processed lunch meat at the store. Ah, guilt-free turkey. And, it came out juicy and tender! I used my electric knife* to slice it thinly, but you could use a carving knife instead. A quick and easy method! I like to make the turkey breast tenderloins for dinner (I buy extra) and then slice the rest thinly for sandwiches. Preheat your oven to 400 degrees F. Line a rimmed baking sheet with foil. Place your turkey on the foil and top each tenderloin with a teaspoon of oil. Rub the oil all over the turkey, on both sides. Wash your hands well. Loosely cover the turkey with foil and let the turkey rest for 10 minutes before slicing. Slice thinly for luncheon meat, or make thicker slices for dinner. Great post Mamma C! My son is back home after graduating college and therefore packing a lunch again. I was pondering different options other than peanut butter and jelly and cold cuts. This is perfect. I’ve actually been feeling guilty buying those cold cuts. On my way to the store…I crossed off cold cuts and wrote in turkey tenderloins! I’m so glad this was helpful, Karen! I hope your son enjoys the turkey. What a smart idea! Ben needs to watch his sodium too so I definitely want to try this! It’s one of those things that’s so simple and good, you’ll wonder why you waited so long to try it. Enjoy! No..not just for Thanksgiving anymore Andrea-anytime. You just can not beat a good sandwich my friend. xo Nice job. I’ll definitely be cooking turkey breast tenderloins more often. Thanks, Cheryl! It’s an elegant solution, as they say in innovation circles. 🙂 Thanks, Sue! Oh Brilliant!! And very tempting–I will have to make this for sure, thanks for sharing! I hope you enjoy it, Mahy! I’ve been wanting to make my own lunch meat for about a year but never tried it. You have inspired me! Pinning. I’m glad to hear that, Denise! You’ll be amazed at how simple it is. So much better to roast, chill and carve than buy ready made sandwich fillings. I’d bet it is way cheaper too. I haven’t figured out the cost comparison, but I’m sure you’re right, Helen. Thats so great that you can make your own lunch meat! So much healthier than the packaged deli meat! I know, I’m really excited! I just love a simple sandwich like this especially when the weather gets hot! Looks good! 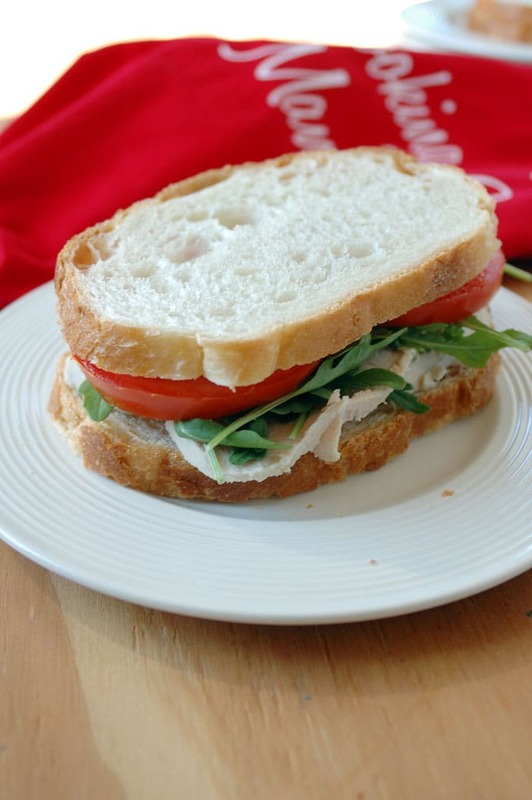 The turkey is really tasty and makes a great sandwich with mayo or barbecue sauce. Thanks, Catherine!